Posted in red devils with tags big pete, reunion tour 2017, zz top on June 17, 2017 by J.J. UPDATED JULY 4: One more added: July 27 at Enler Delta Blues Club in Comber, Ireland. UPDATED JULY 1: The Red Devils have filled in July 16 with a gig at Das Hobo — the Hobo Jazz Bar — in Hildesheim, Germany. Big Pete confirmed that one with nofightin.com Friday, and we have updated this post. I haven’t seen the date on the club’s website or Facebook, but I don’t speak German! If any German readers can help out, drop me a line. ORIGINAL POST: Festivals, club gigs and an opening slot on the ZZ Top “Tonnage” tour will give ample opportunity to see The Red Devils in many places in many different situations in July. Here is the latest roundup we have compiled from ZZ Top, Big Pete and other sources. Be advised that the Top has a couple of gigs listed on their site the don’t include the Devils … this list is all confirmed or pending Red Devils performances in July. Be sure to let us know if there are additions or corrections. Posted in red devils with tags red devils, reunion tour 2017, zz top on April 23, 2017 by J.J. Here are all the dates we have — so far — for The Red Devils June and July across Europe. Solo shows, festivals and an opening stint on ZZ Top’s summer tour mean there are plenty of chances to see the gang in a variety of venues. 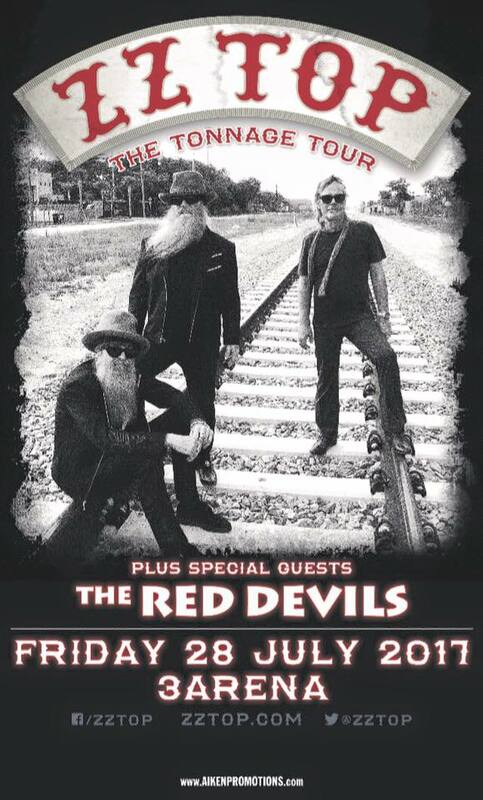 Posted in red devils with tags billy gibbons, jonny ray, reunion tour 2017, zz top on March 16, 2017 by J.J.
Long in the works, The Red Devils reunion tour takes them to Dublin, Ireland, July 28, for an opening slot on ZZ Top’s “Tonnage Tour.” Billy Gibbons has long been connected to The Red Devils, so the pairing makes perfect sense.